Five people were injured while riding a Metro escalator Tuesday morning at the L'Enfant Plaza station, according to the transit agency. Metro said that at about 8:30 a.m. a customer’s bag or garment was caught in the side of the escalator at L’Enfant Plaza, which caused others to lose their balance and fall. There were five people injured -- three were taken to a local hospital with cuts and scrapes and two were treated at the scene. The escalator is being inspected. 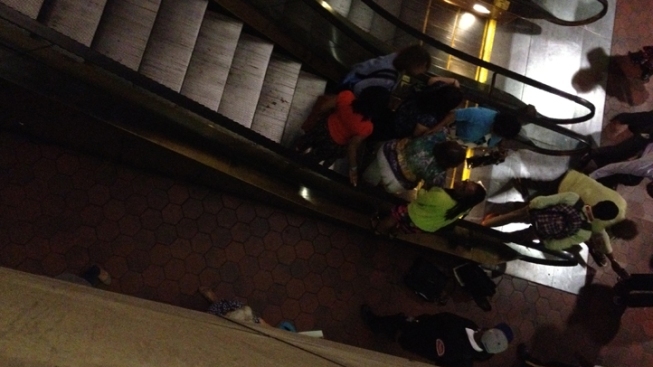 "I just witnessed a frightening incident at the L'enfant Metro station on August 7th, Tuesday morning at about 8:20 am. I was heading upstairs on the escalator and heard a very loud screeching noise from one of the escalators heading downward. Suddenly, people were screaming, running in both directions and falling on one of the escalators that was heading downstairs. The escalator stopped and there was a lady who had fallen at the bottom and her leg appeared to be injured, cut and bleeding. There was a large piece of the escalator clearly separated and hanging. Surprisingly, it took a couple minutes before a Metro employee arrived to the scene." "I too was at L'Enfant Plaza when the incident happened. In fact, I was on the escalator just prior to the 5 people who were injured. I just want to note that the large metal piece of escalator siding that is visible in the pictures you posted was already banging against the escalator stairs when I went down. This siding did not get caught on someone's bag and ripped up. It got caught against a women's leg and tripped her. Notably, the large piece of metal actually reached over to the middle escalator as well, but after the escalators were stopped, some customers pushed it back onto the first escalator, so that the middle escalator could still be used."